Welcome to our largest project to date: a budget-friendly, semi-DIY kitchen renovation. Why “semi-DIY”? 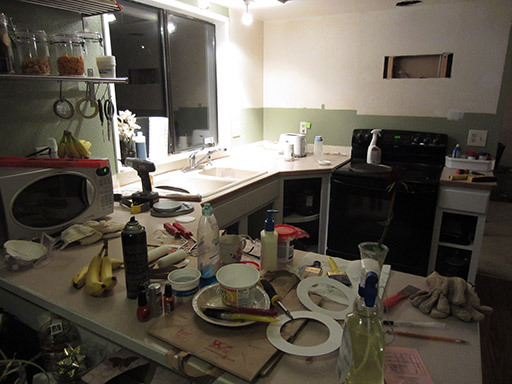 Well, we won’t make or install the countertop ourselves, and we’re going to let the pros install the floor, but we’ll handle the demolition, cabinet refinishing, cabinet knobs, tiled backsplash, all patching and painting. We’re somewhere between “hand it all off to a contractor” and “cast our own countertop out of concrete”. If you can swing a hammer and know your way around Home Depot, you’re as skilled as we were when we started this project! To give you a sense of time, most of this project was completed over the course of 2 months (and we both work full time, so we did most of this in our evenings and weekends). If you’re reading this in 2014, good news: I’ve recently updated these articles to tell you how our renovated kitchen has held up over the past 2 years! Tear out cabinets – Completed 2/2012! Strip varnish off cabinet doors – Completed 2/2012! Sand cabinet doors – Completed 2/2012! Prime cabinet doors – Completed 2/2012! Final coat of paint on cabinet doors – Completed 2/2012! Paint the pantry door – Completed 2/2012! Install a powerful range hood – Completed 3/2012! 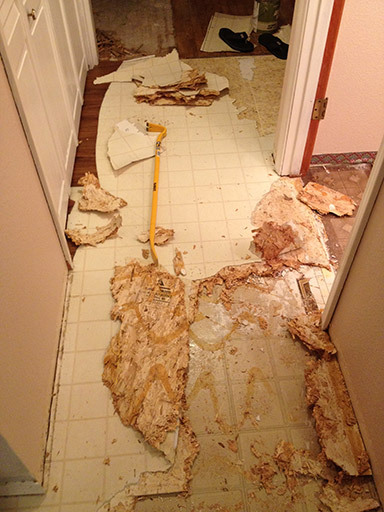 Tear out mix of vinyl and hardwood flooring – Completed 3/2012! Laminate flooring professionally installed – Completed 4/2012! Remove popcorn ceiling – Completed 4/2012! Replace countertop, sink, and faucet – Completed 4/2012! Add pull knobs to kitchen cabinets and drawers – Completed 1/2013! Patch the ceiling hole adjacent to range hood duct – Completed 1/2013! Tile a new 6″ backsplash – Completed 4/2013! All told, we spent about $6,000 on this kitchen remodel. Some things, like the flooring and popcorn ceiling removal, were actually done to many rooms (not just the kitchen). What to prioritize in a kitchen remodel? Make a list of what really irritates you in your kitchen. Maybe everything irritates you, but if you can pick just 3 or 4 things it’ll help you focus your budget. The too-small 2-bowl sink. I went with a gigantic stainless steel undermount sink. Weak ventilation – I really wanted a rangehood. When in doubt, prioritize usability. Make your kitchen enjoyable to use with a big sink and flexible faucet. Also, your choice of materials matters a lot – a few $ difference per square foot for a thing like flooring or a countertop doesn’t sound like much until you look at the full price. We were constantly trying to strike a balance between quality and savings. We also didn’t replace any appliances. So many kitchen remodels involve chucking an entire set of perfectly good appliances just to get more modern features or a stainless steel finish. If your appliances are like ours and they work fine, consider replacing them when they break, not when they’re perfectly fine, and you’ll find a kitchen remodel much more affordable. Can you DIY your kitchen renovation? Renovating your own kitchen is hell. Everybody loves “before and after”, but not many people like to show off the ugly in-between. A DIY renovation of this scope is not for the weak. But I’m guessing if you’re reading this blog, you’re not a pansy who outsources everything short of dressing yourself in the morning to someone else. If you love rolling up your sleeves and saving thousands of dollars, you might have what it takes! But here’s some fair warning. Our kitchen – no, most of our downstairs floor – looked like this for over 2 months. For various stretches of time, we lived with holes in the wall, torn up floor (for a month! ), and tools on every horizontal surface. Okay then! On that happy note, let’s get going!!! It’s time to UPDATE THIS KITCHEN!! YEAH LET’S DO IT, RAWWWRRR!!!! AND LET’S DO IT ON A TINY BUDGET!!! Will I ruin my cabinets? Will I glue my hand to the counter? 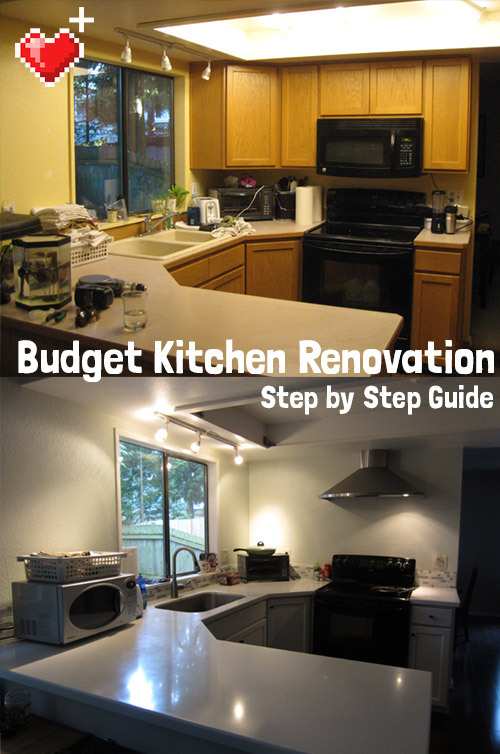 Follow along with our budget kitchen renovation and find out! Next stop, cabinet tear-out!